Here in Chicago, a great number of people freak out if you suggest putting ketchup on a hot dog. The idea is that a Chicago hot dog—with its specific toppings assemblage from tomato slices and sport peppers to mustard and dill pickle—is itself a perfect food item that requires no alterations... such as ketchup. But somehow, Chicagoans have bastardized this idea, and will gleefully pooh-pooh those who put ketchup on any hot dog. To me, it’s a dumb argument born of stubborn civic pride—every backyard barbecue serves hot dogs squirted with ketchup and mustard. What seems to be the more polarizing hot dog condiment choice, however, is mayonnaise. Even amongst the food-knowledgable staff of The Takeout, there is disagreement whether mayo is a natural topping for hot dogs. Let us state our arguments, and you tell us in the comments section if we’re out of our minds. As an avowed mayo enthusiast—I’ll dunk my fries in it, make tuna salad with it, etc.—this is one application of mayo I cannot get behind. I’m not here to tell you it’s wrong in the way these muscular kangaroos are wrong, or grown men on Razor scooters are wrong, but there are so many hot dog toppings that are superior to mayonnaise: spicy mustard, briny sauerkraut, savory chili—hell, even the sweet-tanginess of ketchup. Mayo, for me, serves to add creaminess and fattiness to an otherwise texturally dry dish (see: French fries, canned tuna, sandwich breads). A hot dog is already juicy and fatty, so it calls for a vinegary counterpoint to its meatiness, not more richness. The best hot dog toppings—for me, that’s sauerkraut, mustard, and/or a loaded Chicago dog’s accoutrements—provide brightness and a flavorful snap. Mayo, though I love it, is not a snappy condiment. Save it for your turkey sandwiches, and pass me the spicy mustard for this dog. To your point, Kate, about adding fat to something that’s already fat—this fat person will argue that béarnaise sauce with a ribeye steak is one of life’s singular pleasures. And heck, if you can slather mayo on a hamburger, why not a hot dog? Textural arguments aside, the more compelling case is flavor. I went to college in Southern California, and after football games on Saturday, there’d always be street vendors selling Sonoran hot dogs. 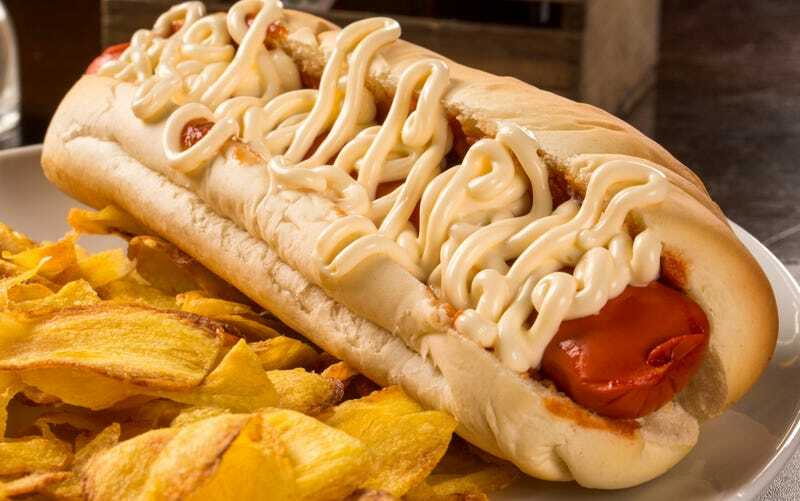 It’s a beautiful work of encased-meat engineering: A wiener wrapped with bacon, grilled, then topped with generous mayonnaise, pinto beans, tomatoes, plus salsa verde. You might think of it as a BLT cross-bred with a hot dog. It’s absolutely delicious. I’m also a huge fan of Japanese-style hot dogs, notably, this Vancouver chain called Japadog. Those crazy bastards add seaweed, bonito flakes, fried noodles on their dogs—and most importantly, a squirt of Kewpie mayo. I’ve already stated my love for Japanese mayonnaise, with its unctuous umami flavor. Like my favorite French fry dipping sauce, Kewpie (or garlic aioli, for that matter) + ketchup + hot sauce is just aces on a hot dog. Just try it once.